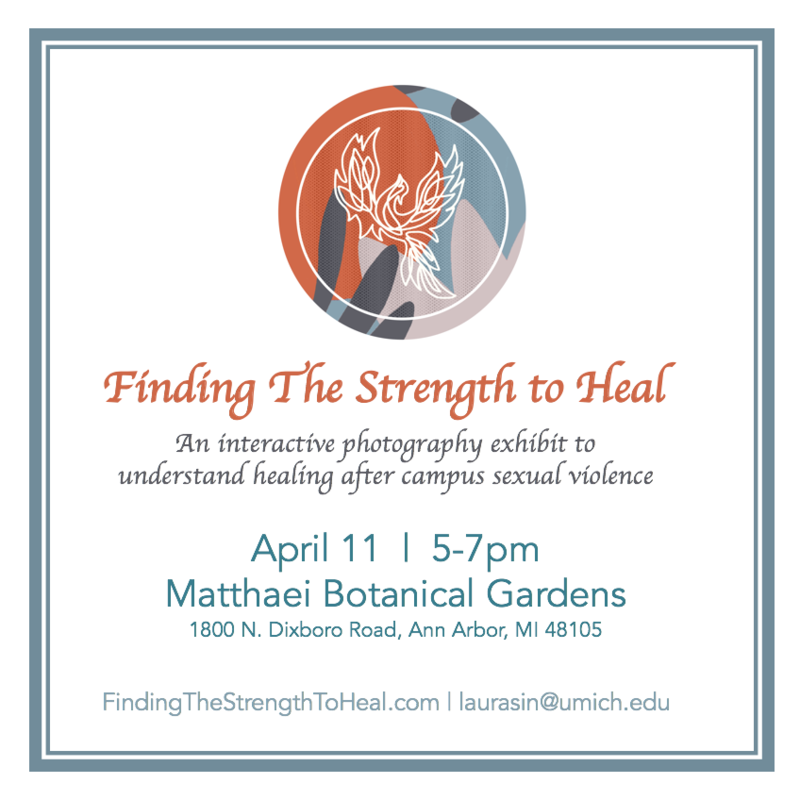 Join us at the Matthaei Botanical Gardens April 11th from 5:00-7:00 for an interactive photography special exhibit highlighting survivors’ healing journeys after experiencing sexual violence on college campuses. The exhibit will feature interviews, advice, and photographs taken by 24 female survivors of undergraduate unwanted sexual experiences, along with stations to highlight the sexual assault response services available at University of Michigan’s campus. Our goal is to teach students and service providers about healing after sexual violence while fostering a dialogue surrounding how universities and service organizations can best support survivor healing and decision-making. This exhibit is for anyone interested in learning more about survivor healing. Survivors, supporters of survivors, allies, service providers, and others are welcome to attend. Blue Bus transportation to the Matthaei Botanical Gardens will be leaving from the Michigan League at 5:00pm and again at 6:00pm on the date of the exhibit. Free parking will also be available onsite. Buses will leave the gardens at 5:30pm and 6:30pm to return students back to the Michigan League upon conclusion of the exhibit.